Email: help@nextofkin.com email us any time, we try to respond within the hour! 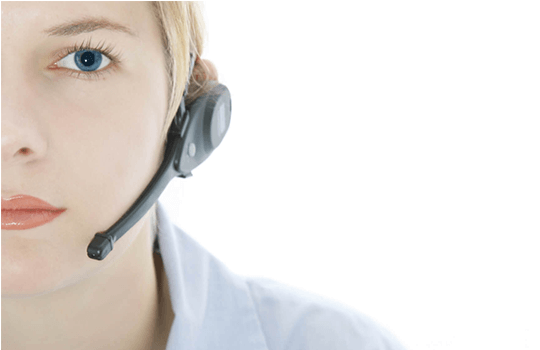 Telephone: 08445 88 88 88 (Simply leave your name and number and a brief message regarding your query and we will call you back as soon as we can. This way we keep the subscription fee from never going up) Try emailing us for free if your query isn't urgent. Calls to this number are charged at 5.8p per minute plus your telephone providers access charge. Membership Packs are just £29.99 each, this is a one off charge. If you have been given a code by your Authorised Agent please enter it below. When you receive your pack in the post you can then activate the operator service online, by post or by phone. The subscription to the operator service is just £2 a month or £15 per year payable by direct debit when you activate. Select Title Mr. Mrs. Ms. Miss. Dr.
Hello, if you have found something which has brought you to our website, please complete the form below with the ID number printed on the item and where our member can contact you to collect their property from and they will be in touch with you very soon. If you add your address here we will send you a free Membership Pack as a thank you. Replacement Membership Packs are £12.95 each, this is a one off charge. Step 1: Membership packs cost just £29.99 each. This is a one off charge. 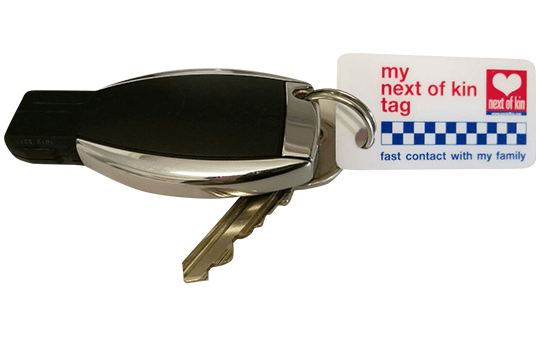 The pack includes your Next of Kin Card & Key Tag, plus 2 emergency window stickers for your home and vehicle and 2 smaller stickers for your mobile phone and passport – plus free delivery is also included. If you have been given a code please use this in the box provided on the order form. When you receive your membership pack simply activate your operator subscription by clicking the green ACTIVATE button at the top of our website or you can register by post using the form in your membership pack. 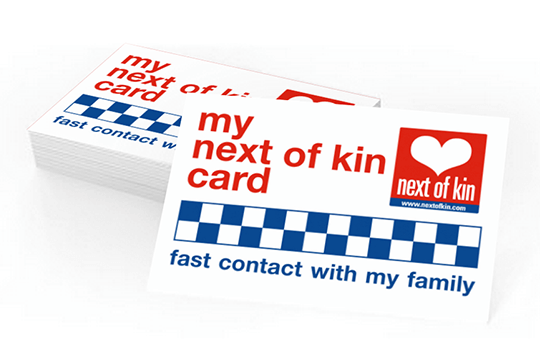 Copyright © 2016 Next of Kin Ltd.
We have agreed that in return for receiving an annual or monthly payment, that in the event of an emergency involving You, We will endeavour, when contacted by the Emergency Services, to provide details to the Emergency Services of Your Next of Kin. This Agreement sets out the terms and conditions on which the Next of Kin service is provided. The singular shall include the plural and vice versa and the masculine gender shall include the feminine. The headings are for convenience only and shall not affect the construction of this Agreement. This Agreement shall be for a period of 12 months commencing from the date the Membership Form is accepted by Us and the annual payment has been collected. Either party may terminate this Agreement by giving 30 days written notice to the other. In such event there shall be no refund of the annual payment. 3.5 ensure that those persons nominated as Next of Kin agree to act as Next of Kin before they are nominated on the Membership Form. 4.1 We will comply with the DPA and in particular the Data Protection Principles set out in it in connection with personal data provided by You and processed as a result of this Agreement. 4.2 You agree that We may fulfil Our obligations by employing or engaging independent contractors to process information or to contact the Next of Kin. Although We will enter into appropriate arrangements with such independent contractors, We shall not be liable for the acts or omissions of such contractors howsoever caused. 4.3 We will take all reasonable steps to ensure that the Emergency Services are given correct details of the Next of Kin in the agreed manner in the event that We are contacted by the Emergency Services. 4.4 Although We shall use reasonable care to ensure that calls received about You are genuine, We cannot accept responsibility if Next of Kin are contacted by mistake or as a result of a hoax or other unauthorized use of the Means of Identification. 4.5 We will use reasonable endeavours to communicate information to Next of Kin. We accept no liability for third party equipment or service failure, (e.g. customer fax machines, Internet service providers, pager/mobile network providers and national and international telecom service providers) including the international emergency number which may not be accessible from certain countries. 5.1 You authorise Us to prepare, complete and submit sales voucher(s) and to debit the credit card specified in the Membership Form attached in order to recover all charges and amounts due and owing to Us under this Agreement. If the credit card or debit card specified in the Membership Form is cancelled You will within seven days of receiving a request from Us, supply Us the details of an alternative credit or debit card, and sign all requisite forms to enable any alternative credit or debit card to be debited by Us. 5.2 Our charges are set out in the Membership Form. All charges payable by You to Us under this Agreement include VAT. You shall pay all charges and other sums due to Us without deduction or set-off. You shall be liable to pay costs on an indemnity basis in the event that We institute legal proceedings to recover Our charges or other sums due to Us from You. whether directly or indirectly resulting from such use. or document so sent shall be deemed to have been served on the second day following the date of posting. No person who is not a party to this Agreement shall have any right under the Contracts (Rights of Third Parties) Act 1999 (the “Act”) to enforce any term of this Agreement provided that this shall not affect any right or remedy of any person which exists or is available otherwise than pursuant to the Act. We shall be under no obligation or liability to any person other than You. No party shall be considered in default in the performance of its obligations under this Agreement or be responsible for any delay in the carrying out of such obligations, if the performance thereof is prevented or delayed wholly or in part as a consequence of any cause beyond the reasonable control of the party affected. No forbearance or indulgence by either party in enforcing any term or condition of this Agreement shall prejudice or restrict such party’s rights under this Agreement and no waiver of any breach shall operate as a waiver of any subsequent or continuing breach of such term or condition. It is expressly agreed between the parties that the liability for any damages arising out of the provision of the services under this Agreement, whether caused by Our negligence or that of Our employees or contractors or otherwise shall be limited to actual damages but shall in no event exceed £19.95. The parties acknowledge that damages would be difficult to ascertain and quantify and agree that this provision liquidates the damages and is not a penalty. This Agreement together with the Membership Form represent the entire understanding between the parties in relation to the subject matter of this Agreement and supersedes all other agreements and representations made by either party, whether oral or written and this Agreement may only be modified if such modification is in writing and signed by a duly authorised representative to each party hereto. This Agreement shall be governed by and construed and interpreted in accordance with English Law and the parties submit to the exclusive jurisdiction of the English courts. This website and its owners through their social media platform accounts may share web links to relevant web pages. By default some social media platforms shorten lengthy urls www.nextofkin.com/cost (this is an example: http://tinyurl.com/qdshs4d).